↑ "ADS-B at Kuala Lumpur To Boost Landings, FIR Restructuring". Aviation International News (in English). Retrieved 15 ᱚᱠᱴᱚᱵᱚᱨ 2017. 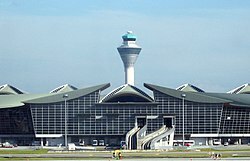 ᱣᱤᱠᱤᱢᱤᱰᱤᱭᱟ ᱠᱚᱢᱚᱱᱥ ᱨᱮ Kuala Lumpur International Airport ᱵᱟᱵᱚᱛᱫᱽ ᱛᱮ ᱨᱮᱫ ᱢᱮᱱᱟᱜᱼᱟ ᱾.